INFORMATION technology job advertisements in Singapore rose 35 per cent in the fourth quarter of 2016 from a year earlier, said recruitment firm Robert Walters on Monday as it released the results of its Asia Job Index for Q4 2016. High in demand were professionals who could handle digital platforms, cybersecurity and project management. Meanwhile, job advertisements for product and logistics operations grew 17 per cent, driven by the increase in outsourcing of warehousing and distribution functions to leading organisations. Demand was high for contract logistics professionals, especially at the junior to mid-level in the healthcare industry, said Robert Walters. However, job advertisements in the accounting and finance sector fell 9 per cent. Toby Fowlston, managing director of Robert Walters South-east Asia, said: "Firms, especially within the investment banking sector, decreased hiring budgets in a bid to save costs and/or continued offshoring to cheaper cost locations. "Sectors such as oil and gas, and manufacturing also remained under duress due to ongoing economic uncertainty." 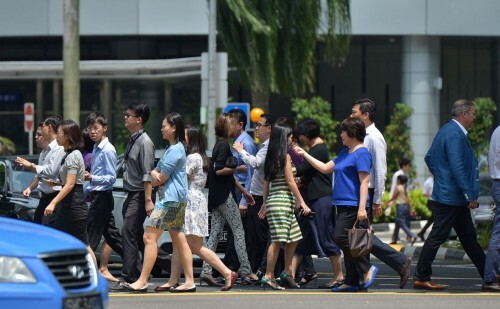 For the full year, Singapore notched a one per cent decrease in total job advertisements. The Asia Job Index tracks advertisement volumes for executive positions across leading job boards and newspapers in China, Hong Kong, Malaysia, Singapore and Taiwan. In Singapore, job advertisements in The Straits Times and on eFinancialCareers.com, JobsCentral, jobsDB, JobStreet, Linkedin, Monster.com.sg and ST701.com.sg were tracked. Overall, employers remained slightly cautious about hiring in Q4 due to economic and political uncertainties, said the firm. But there was an overall increase of 10 per cent in job advertisements for tech professionals, and a 9 per cent rise in job advertisements for legal and compliance professionals. Meanwhile, job advertisements in human resources grew 5 per cent. In China, demand for IT professionals rose 25 per cent. Those with skills in big data, Internet finance and robotics were the most sought after. Driving a 19 per cent increase in job advertisements in the product and logistics operations sector was the growth in e-commerce, said Robert Walters. In Hong Kong, demand for compliance professionals rose 27 per cent due to "stricter regulatory and compliance laws which impacted the banking and financial services sectors, among others". Across all markets surveyed, localisation of talent was a priority. "(Firms) continued to seek both domestic talent and those returning from overseas to fulfil key strategic positions," said Robert Walters.